At LA Carpet’s Corona location in Riverside County you will find the same diverse selection of flooring material as you would in any of our other locations. Open seven days a week, LA Carpet Corona provides free consultation and in-home services to its customers in the surrounding area. 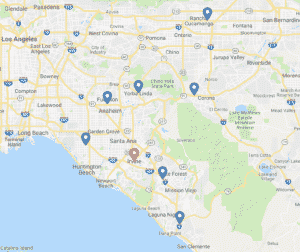 If you live in the Corona or Riverside area, you can enjoy in-home estimates and measurements, design consultation, and shop-at-home services. If you need help with selecting the best in flooring, countertop options, kitchen remodeling, or just basic advice on flooring to fit your home’s style, we have service professionals and experts to help. Located at 2410 Wardlow Road, just off the Riverside Freeway (Route 91), LA Carpet Corona is easily accessed by car and transit. LA Carpet Corona is conveniently located just a couple blocks from the Metrolink Corona West station, which sits just one station away from Orange County, and three from San Bernardino. Once known as the “Lemon Capital of the World”, Corona is home to just over a 150,000 citizens and upscale neighborhoods and serves as a bedroom community for nearby Los Angeles and Orange County. So if you’re nearby and looking for the best in carpet, tile, natural stone, luxury vinyl and more, stop in — we guarantee competitive prices and exceptional customer service.